Little did I know that just three years later, Codenames has not only appeared on the shelf at Target, but it has had its own Target-exclusive edition; that Codenames would more-than-crack the top 100 on Board Game Geek (currently sitting at #48 after a fall from the teens); or that my family would become utterly obsessed with the game. Indeed, I have introduced a lot of games to my family over the years, and they’ve enthusiastically tried most of them, but I think they’d be content if all they had was Bohnanza and Codenames. So releasing a new, giant, “deluxe” version just makes sense. But is bigger better? Yep, Codenames XXL is certainly bigger. Before I answer that question, let’s return to my family. Codenames has been a big hit, but when I first introduced Codenames to my family, one of my aunts had just had eye surgery. She wanted to play but had trouble reading the twenty-five words from across the table. Our solution was to create a crib sheet for her, writing out each of the twenty-five words. We did this for every board, and while it’s not the most elegant solution, it was a way we could all enjoy the game together. And diminishing eyesight is only going to be more of a concern in my family. Codenames XXL has arrived not a moment too soon. Codenames XXL set up. This is a Costco fold-in-half table, a little less than three feet wide. 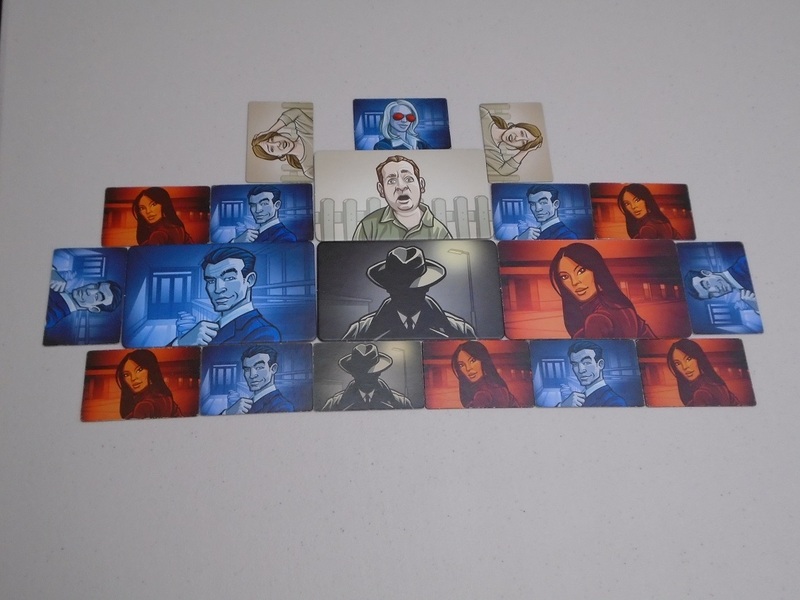 For scale, here’s the original Codenames cards laid in a 5×5 grid on top of the XXL cards. As you can see, it covers a 3×3 section of Codenames XXL. When I first opened the package for Codenames XXL, I thought it was obscenely big. Too big, in fact. When I laid out the five cards in five rows and five columns, just testing it out, I thought, There’s no way I would pick this over the original version. It’s so big! The box was gigantic, and storage concerns immediately came to mind. But now that I’ve played with XXL…well, I’ve kind of changed my mind on that front. 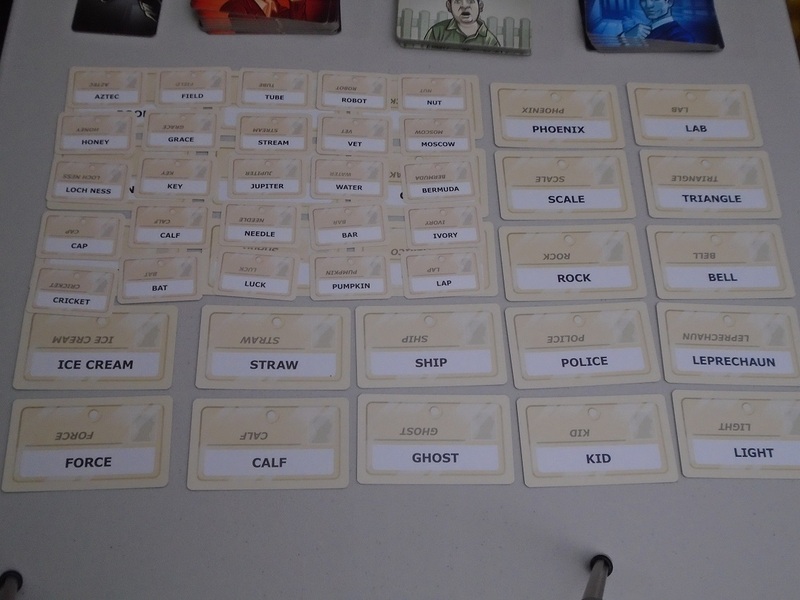 Looking at Codenames XXL while it’s still in the box or set up on a test table is a very different experience from playing with it. Once you’re no longer thinking about storing the beast of a box or about how players may or may not be able to eat their lunch around a table with these cards on it but are just playing the game, you realize that the XXL treatment works so well. I had forgotten just how much leaning there usually is in Codenames, especially with larger groups. The current team tries to get a closer look at the small cards and has to lean around the table to make sure they aren’t missing their words. The spymaster usually has to lean a little to make sure they’re seeing all the words before forming their clues. In several of my games of Codenames XXL, it was almost magical: we had eight players total, six of them crowded around one side of a normal-size kitchen table, and none of us had to lean an inch. Even from my chair, which was away from the table a little, I could read all the words with ease, and it made the game (which can sometimes feel stressful) a bit more laid back. Beyond the functionality question, one of the spymasters who played commented on just how satisfying it is to place the thick cardboard identifiers on the board, especially when one of your words is guessed, and I can’t disagree with this. I’m typically a Euro gamer, and I place a strong emphasis on function over form. Yes, I like pretty games, but if it plays well, that’s what matters. The XXL treatment for Codenames appeals both to function and form: it is both easier and more satisfying to play in its giant configuration. So I really like Codenames XXL. But the inevitable question is, Do you need it? Obviously, only you can answer that question. 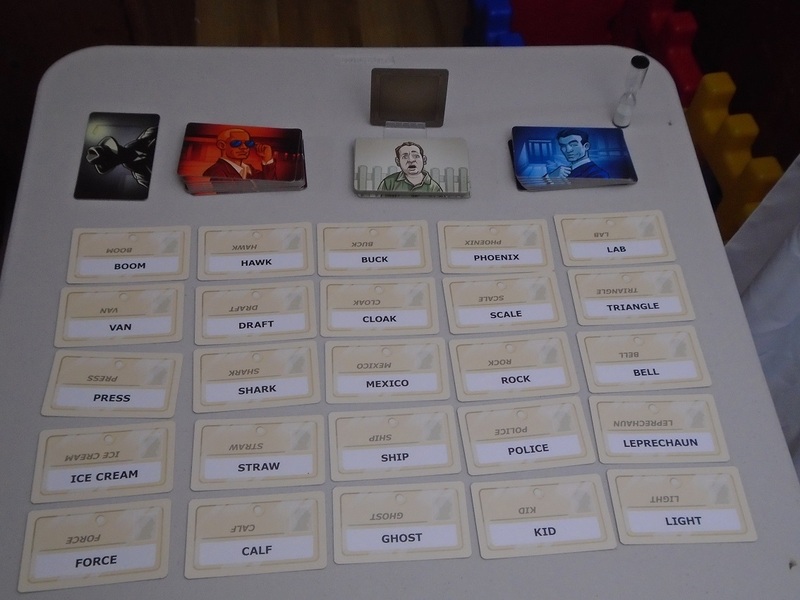 But here are my impressions from testing Codenames XXL. The cards are the same in XXL, just… Well, you’ve got it by now. Like most giant versions of board games (which typically originate as publisher demo copies), Codenames XXL is for the super fan. 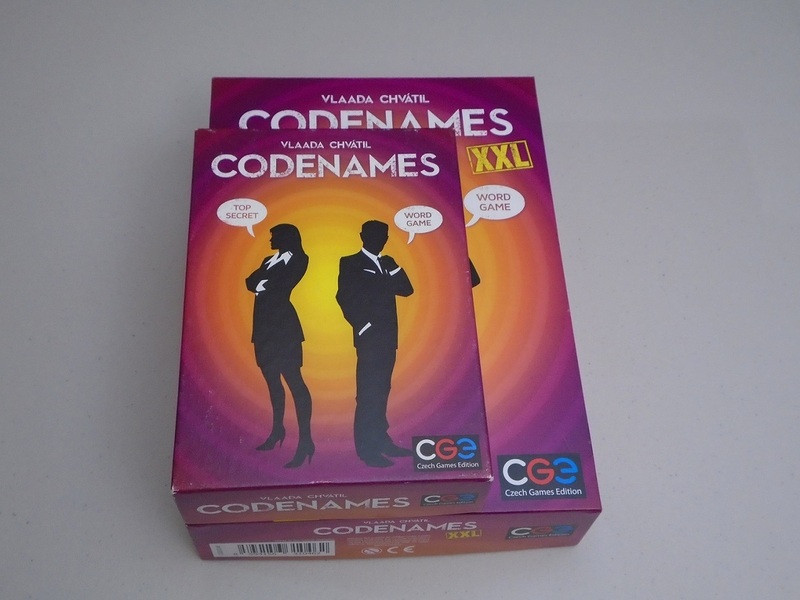 But even beyond this, I would say Codenames XXL is for the super fan who also is likely to host board game events. Because of the large cards (and the tendency people have to hover around games of Codenames anyway), it’s a set piece as well as a game. 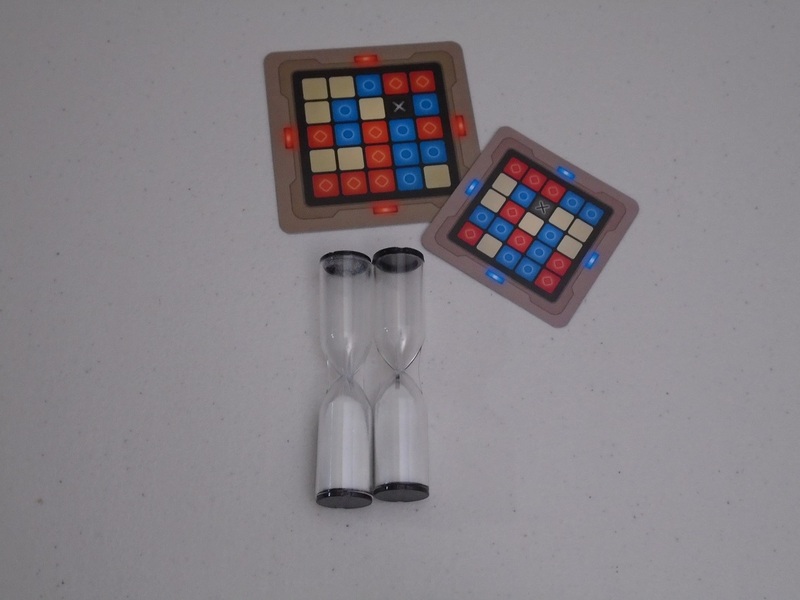 This works great at the board game meetup, but it’s a little less practical for home use, especially if you’re playing the two-player game or even a game between couples. 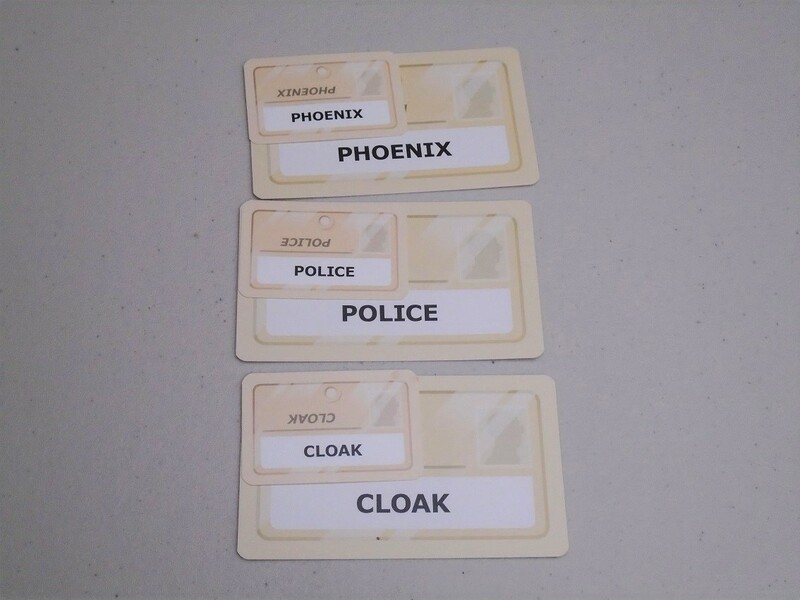 The Codenames XXL ID cards versus regular Codenames. The photos of Codenames XXL in this review were taken on my folding table that we set up for board game overflow if lots of people come to game night or if we’re hosting Thanksgiving dinner. It’s a big table. The 5×5 grid for the XXL cards takes up almost the entire width of this table. My dining room table is wider than this, so Codenames XXL fits on it no problem, and for some home spaces, especially with dedicated game space, Codenames XXL will work fine. Everything is bigger! Except the timer. But when I consider all the spaces where I’ve played Codenames–on my kitchen table, yes, but also on the skinny tables in the lunch room at work; on the coffee table in my house when we have lots of friends over who want to sit in a cozy space; on the card table at my aunts’ house–Codenames XXL can seem a little too big. 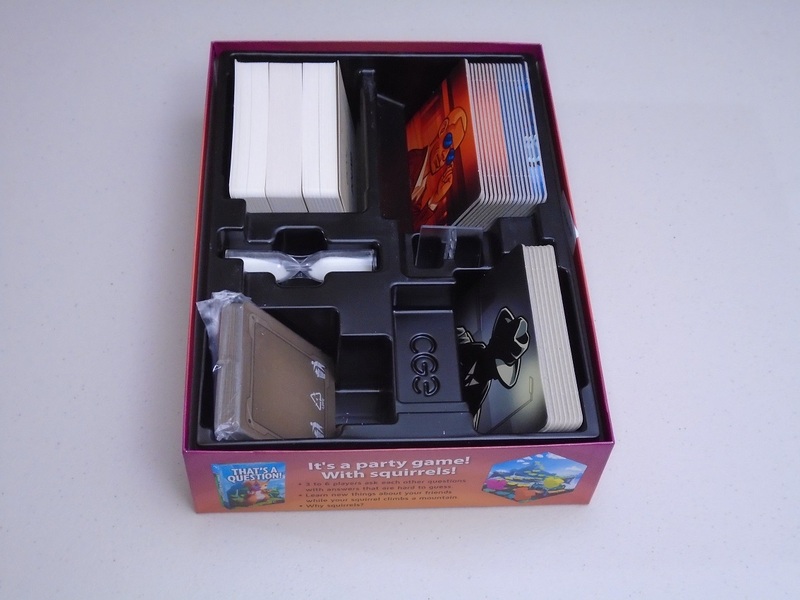 In addition to just the table presence, the box is bigger than most standard Euro game boxes, making it less convenient to cart around and more of an intrusion when suggested for a party. One can nonchalantly suggest Codenames to unsuspecting board gaming muggles. There’s nothing nonchalant about Codenames XXL. The giant version is that desperate-for-attention friend who demands to be the center of all conversation and activity. Again, this is fine, as long as you know what you’re getting yourself into. The insert for Codenames XXL. This is a nice upgrade from the basic version. Of course, I say this, and I recognize that XXL isn’t practical for all my gaming spaces, but I also find it hard to deny that it is very cool to see and play a giant version of Codenames. Sure, it’s cumbersome. Sure, you need to plan ahead for space and attention concerns. But it is more readable, and the gameplay is good enough that it justifies this lavish treatment. My opinion of Codenames XXL can be summed up in a conversation I had with a fellow player after one of our games of XXL. He said, “After playing this, I never want to play regular Codenames again.” And I replied, “Easy for you to say–you don’t have to store it.” Codenames XXL is the kind of game you want to have on hand for your game group, but it’s also one that you want someone else to schlep around to game nights rather than stuffing it in your own game bag. If you’re okay being the one to cart this to and fro, for the sake of the group, then this is worth getting. I’ve decided that I’m willing to be this person. So, is Codenames XXL right for you? It’s worth asking yourself 1) do you already love Codenames? and 2) do you have a space where you can properly show off the giant version? Also worth asking are 3) will it annoy you that Codenames XXL is not as portable or break-out-able as the regular-sized version? and 4) will it annoy you to store the larger version in your collection? If your answers are yes, yes, no, and no, then Codenames XXL is absolutely right for you. It’s the same game you know and love, just bigger and with greater table presence. 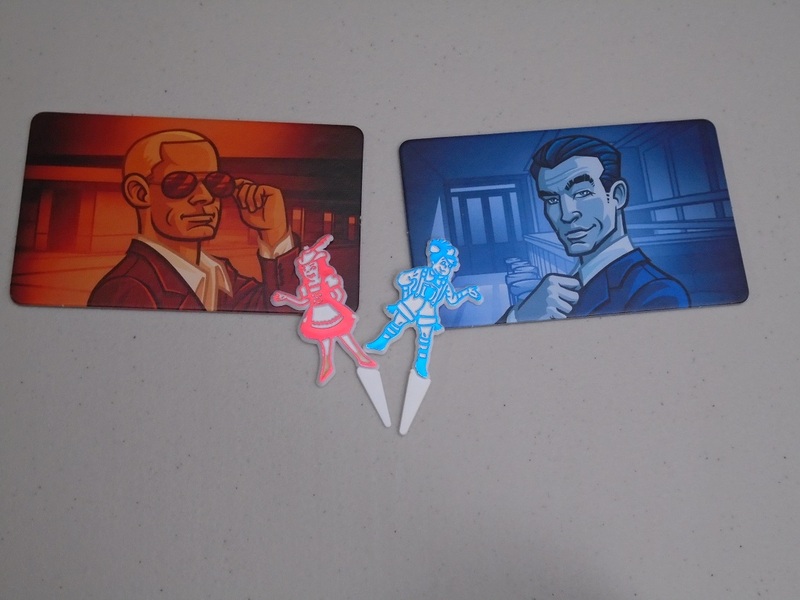 For me, even though I already have Codenames and Codenames Duet and Codenames Pictures, I will probably keep Codenames XXL (and, because of portability/small space concerns, I will probably keep regular Codenames as well). Yes, the XXL box is bigger. Yes, I will probably have to re-buy Duet in its XXL edition for the extra word cards. Yes, it can be an obnoxious table hog if you need to put anything else on the table with it. But the usability gains and fun table presence make this one worth keeping on hand, especially for larger groups. Codenames XXL isn’t for everyone, and I wouldn’t have thought it’s for me, but after playing it, I guess it is. Codenames is excellent; Codenames XXL is excellent and big. And that’s okay in my book. 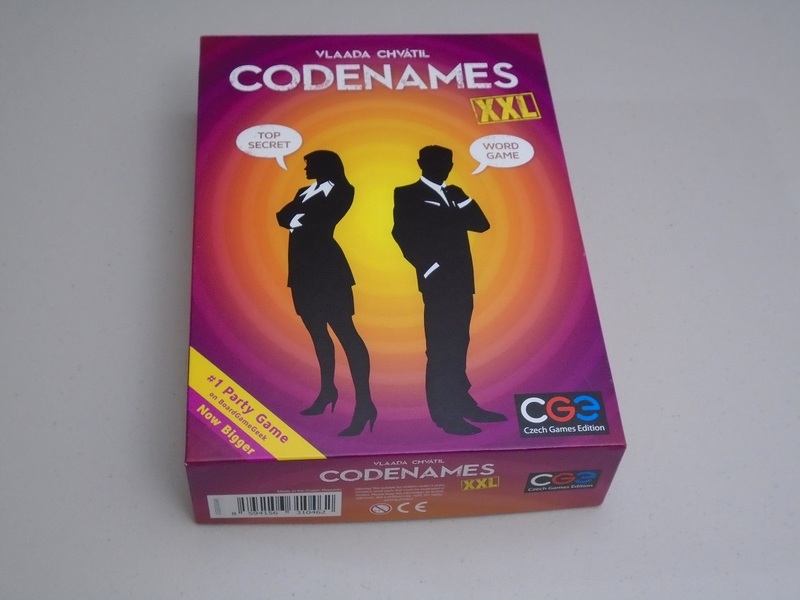 iSlaytheDragon would like to thank Czech Games Edition for providing us with a copy of Codenames XXL for review. Great review! I have to say it, from time to time I enjoy playing these much larger versions of games. For instance, game stores or even protos at Origins will often have a larger version of games, including Costa Rica, Kingdomino, and others. It has a beautiful presence on the table, but for everyday use, at least right now, I’ll stick to the basic Codenames.